Alconbury is a village and civil parish in Cambridgeshire, England. 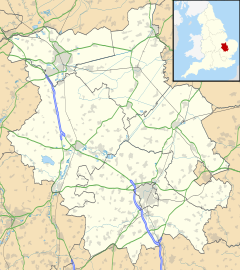 Alconbury is situated within Huntingdonshire which is a non-metropolitan district of Cambridgeshire as well as being an historic county of England. Alconbury lies approximately 5 miles (8 km) north-west of Huntingdon. Alconbury was listed as Acumesberie and Almundeburie in the Hundred of Leightonstone in Huntingdonshire in the Domesday Book. There was one manor 17.5 households at Alconbury. The survey records that there were 18 ploughlands with the capacity for a further two,and 80 acres (32 hectares) of meadows. The church is dedicated to St Peter and St Paul. The Great North Road passed through the village and Alconbury Weston to the north-west. The A1 was dualled from Water Newton to Alconbury Hill in three stages in 1958. The £1.25m two mile A1 bypass opened in December 1964, joining the road at the point where it now meets the A14 (former A604) at the junction at the top of a hill. It followed part of the former A604. In November 1998, the bypass was converted into the A1(M) which terminates next of the village. The former road is partly the B1043 which is also part of the former A14 and the rest of the former A1 to Peterborough. Units of the US Air Force were based at Alconbury from 1942-1945, and then from 1953 to 1995. As a civil parish, Alconbury has its own elected parish council, made up of 10 members.The second tier of local government is Huntingdonshire District Council which is a non-metropolitan district of Cambridgeshire. Alconbury is a part of the district ward of Alconbury and The Stukeleys and is represented on the district council by one councillor. The village's highest tier of local government is Cambridgeshire County Council. Alconbury is a part of the electoral division of Huntingdon and is represented on the county council by two councillors. Cambridgeshire County Council intends to move its headquarters to Alconbury, from Cambridge, by 2020. At Westminster, Alconbury is in the parliamentary constituency of Huntingdon. The current MP is the Conservative Jonathan Djanogly, who has represented the constituency since 2001. Alconbury is part of the East of England constituency. Alconbury was in the historic and administrative county of Huntingdonshire until 1965. From 1965, the village was part of the new administrative county of Huntingdon and Peterborough. In 1974, following the Local Government Act 1972, Alconbury became a part of the county of Cambridgeshire. Alconbury is in the district of Huntingdonshire and gives its name to RAF Alconbury. The village is near to the point where a major north/south road, the A1, crosses the only major east/west road: the A14. As of 2005 there are proposals to convert the airfield (now redundant) into a freight-only commercial airport to benefit from these surface links. Nearby to the east along the A14 are The Stukeleys: Great Stukeley and Little Stukeley. Little Stukeley is nearer to the former airfield than Alconbury. Just north of the A1/A14 junction is Alconbury Hill. The Alconbury Weald development is taking place near to Alconbury village. The research laboratory, Huntingdon Life Sciences, is just south of the village. In the period 1801 to 1901 the population of Alconbury was recorded every ten years by the UK census. During this time the population was in the range of 483 (the lowest in 1801) and 967 (the highest in 1851). In 2011, the parish covered an area of 3,067 acres (1,241 hectares) and so the population density for Alconbury in 2011 was 327.4 persons per square mile (126.4 per square kilometre). The climate in the United Kingdom is defined as a temperate oceanic climate, or Cfb on the Köppen climate classification system, a classification it shares with most of northwest Europe. Eastern areas of the United Kingdom, such as East Anglia, are drier, cooler, less windy and also experience the greatest daily and seasonal temperature variations. Protected from the cool onshore coastal breezes further to the east of the region, Cambridgeshire is warm in summer, and cold and frosty in winter. The nearest Met Office climate station is at Monks Wood, which is 2.5 miles (4.0 km) to the north-east of Alconbury. The average annual rainfall for the United Kingdom between 1981 and 2010 was 1,154 millimetres (45.4 in) but Cambridgeshire is one of the driest counties with around half of the national level. Regional weather forecasting and historical summaries are available from the UK Met Office. Additional local weather stations report periodic figures to the internet via web sites such as Weather Underground. The village has a Neighbourhood Watch group, cricket club, football teams, community choir, a public house, a doctor's surgery, post office and houses the local MP. There is a Church of England primary school, A service station on the B1043/A14 junction closed in August 2007 and re-opened in 2012 under new owners. There are several annual events held in the village including The Neighbourhood Watch Summer Fête, Village Show, Harvest Supper. Biannual events - Christmas tree festival, Scarecrow Festival, open gardens. ^ Ordnance Survey: Landranger map sheet 142 Peterborough (Market Deeping & Chatteris) (Map). Ordnance Survey. 2012. ISBN 9780319229248. ^ Dr Ann Williams; Professor G.H. Martin, eds. (1992). Domesday Book: A Complete Translation. London: Penguin Books. p. 1304. ISBN 0-141-00523-8. ^ Dr Ann Williams; Professor G.H. Martin, eds. (1992). Domesday Book: A Complete Translation. London: Penguin Books. pp. 551–561. ISBN 0-141-00523-8. ^ a b Professor J.J.N. Palmer. "Open Domesday: Place - Alconbury". www.opendomesday.org. Anna Powell-Smith. Retrieved 25 February 2016. ^ "Alconbury Parish Council". alconburyparishcouncil.gov.uk. Retrieved 17 January 2016. ^ a b c "Ordnance Survey Election Maps". www.ordnancesurvey.co.uk. Ordnance Survey. Archived from the original on 20 February 2016. Retrieved 4 February 2016. ^ "Huntingdonshire District Council: Councillors". www.huntsdc.gov.uk. Huntingdonshire District Council. Retrieved 4 February 2016. ^ "Cambridgeshire County Council: Councillors". www.cambridgeshire.gov.uk. Cambridgeshire County Council. Archived from the original (pdf) on 5 February 2016. Retrieved 4 February 2016. ^ "County council backs HQ move to new site". BBC News. 15 May 2018. Retrieved 20 July 2018. ^ a b c "Historic Census figures Cambridgeshire to 2011". www.cambridgeshireinsight.org.uk. Cambridgeshire Insight. Archived from the original (xlsx - download) on 15 February 2016. Retrieved 12 February 2016. ^ "Forecast:East of England". UK Weather Forecasts. UK Met Office. Retrieved 3 January 2016. ^ "Monks Wood Climate: Averages Table". UK Climate Summaries. UK Met Office. Retrieved 3 January 2016. ^ "Alconbury, United Kingdom". Weather Underground, Inc. 2016. Retrieved 3 January 2016. Wikimedia Commons has media related to Alconbury.